¶ To me, Kick Starters fall into two groups. Those you can fix easily and those you can't easily fix. Let's look at the hard to fix ones first. Some designers place every part of the Kick Starter inside the crankcase, with only the shaft sticking out. 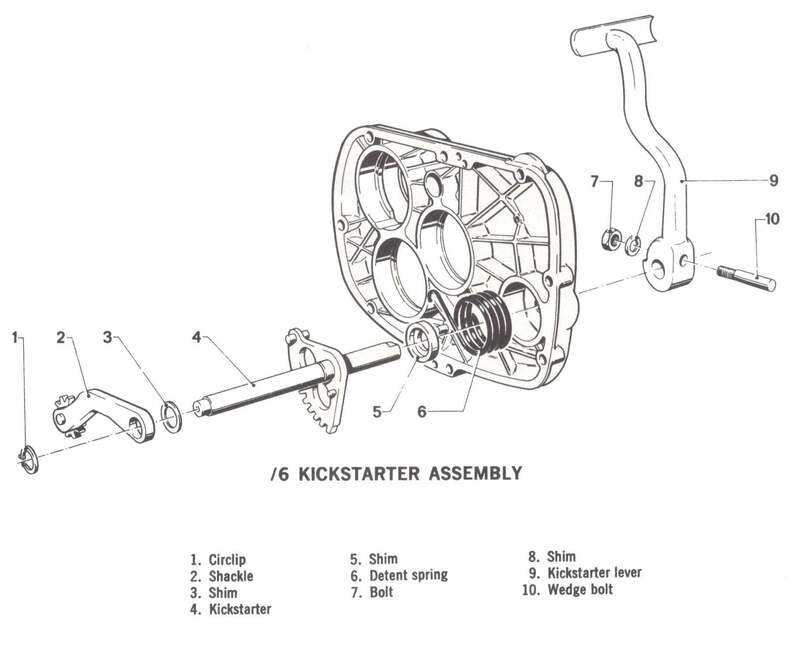 The Kick Starter has a gear on it's shaft. That gear moves back and forth on the shaft in grooves cut in the shaft. When you turn the Kick Starter the gear is thrown into mesh with an idler gear which in turn is in mesh with the mainshaft of the transmission. 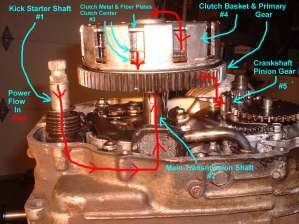 The mainshaft is connected to the clutch and the clutch is connected to the engine crankshaft. 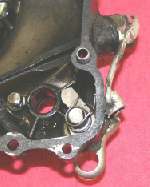 When the engine starts and you release the pressure on the Kick Starter, the kick start gear is thrown out of mesh with the idler gear. The problem with this arrangement is that all the Kick Starter gears and springs are within the crankcase. 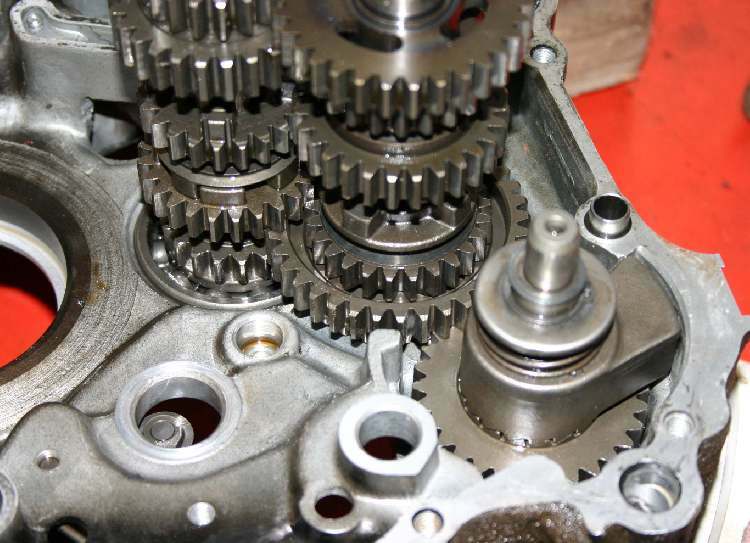 You must remove the engine from the frame and split the crankcase if a gear or spring breaks. This is not good. 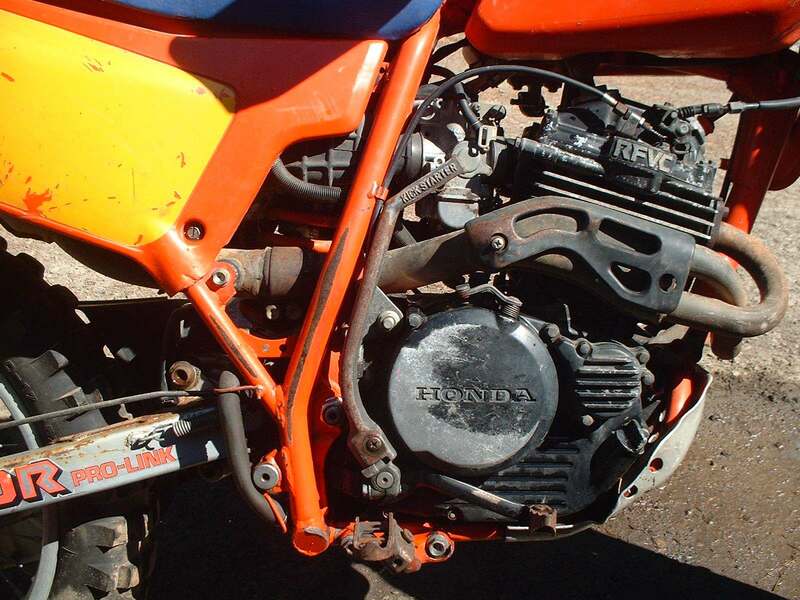 A lot of the early Honda dirt bikes were like this. 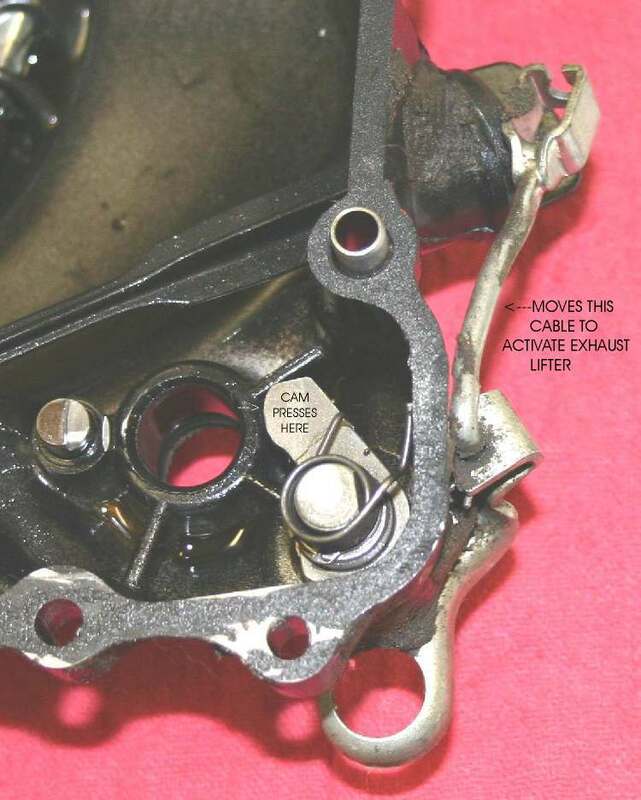 A slightly better way has the kicksarter return spring on the outside of the crankcase and everything else on the inside. At least with this arrangement you can replace the spring if it breaks. Kick Starter Spring outside the Crankcases. 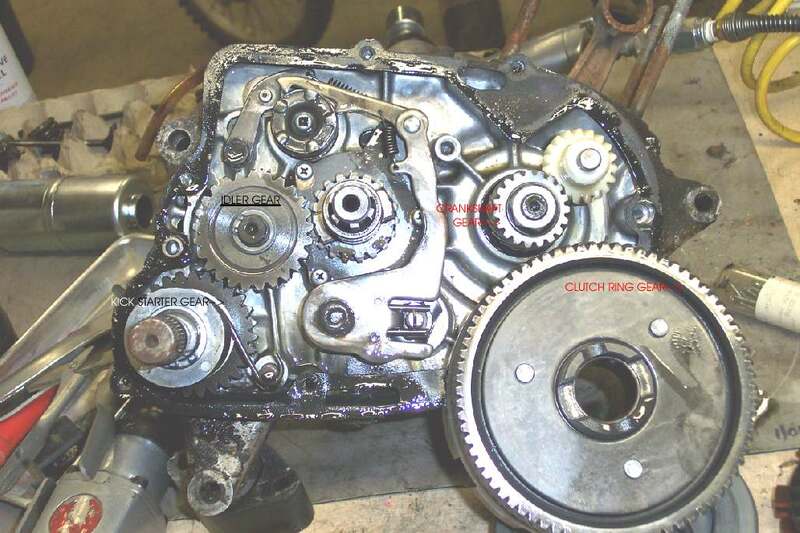 The best way is with everything on the outside of the crankcase. It basically works the same as the internal type but you can easily get to everything to fix it. Just take off the clutch cover and, at worst, the clutch basket and there you are. The kick starter shaft turns, forcing the Kick Starter gear into mesh with the idler gear. 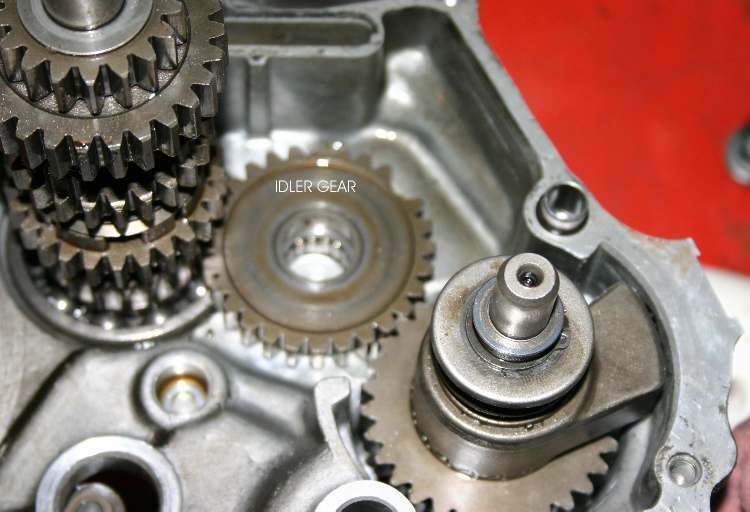 The idler gear is already in mesh with the big ring gear on the clutch, which is also in mesh with the gear on the end of the crankshaft. All this turns the engine over and starts it up. 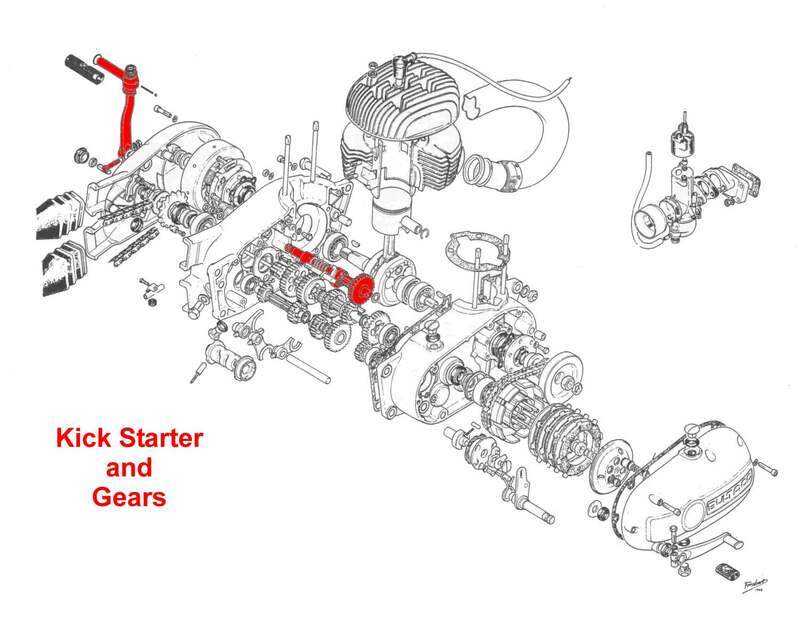 To work, the starter gear has to be able to lock in place when the Kick Starter is depressed and then unlock when the Kick Starter is released and the engine starts. There are a lot of ways to do this. A Full Ratchet Kick Starter is another way to engage and disengage a starter gear. A beveled edged arm, or Ratchet Tab, is cast as part of the starter ratchet. This arm pushes against an angled metal lock out plate, when the Kick Starter is at rest, pushing the ratchet out of mesh with the starter gear. 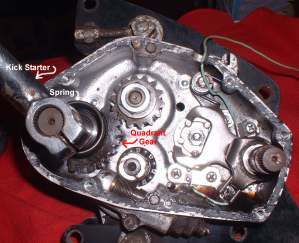 The starter gear is in mesh with the idler gear and spins with it freely. 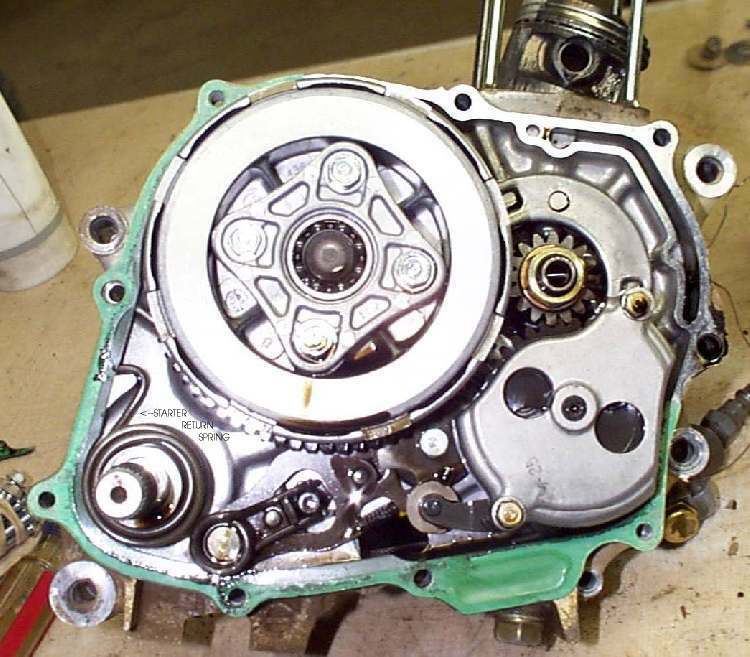 Pushed by a spring, when the Kick Starter shaft is turned, the ratchet locks with the starter gear turning the engine over, and starting the engine. 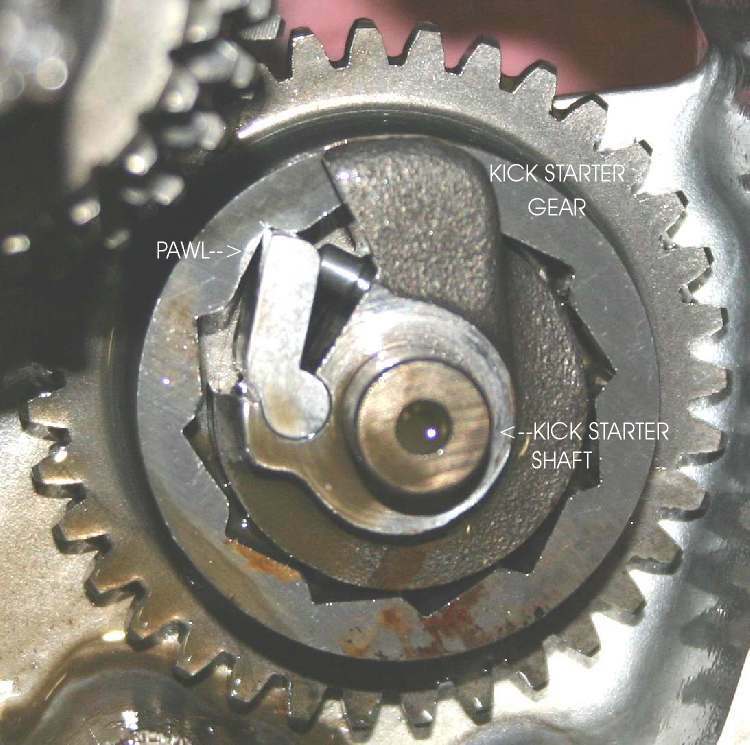 In a Pawl Ratchet Kick Starter there are pawls between the Kick Starter shaft and the Kick Starter gear. 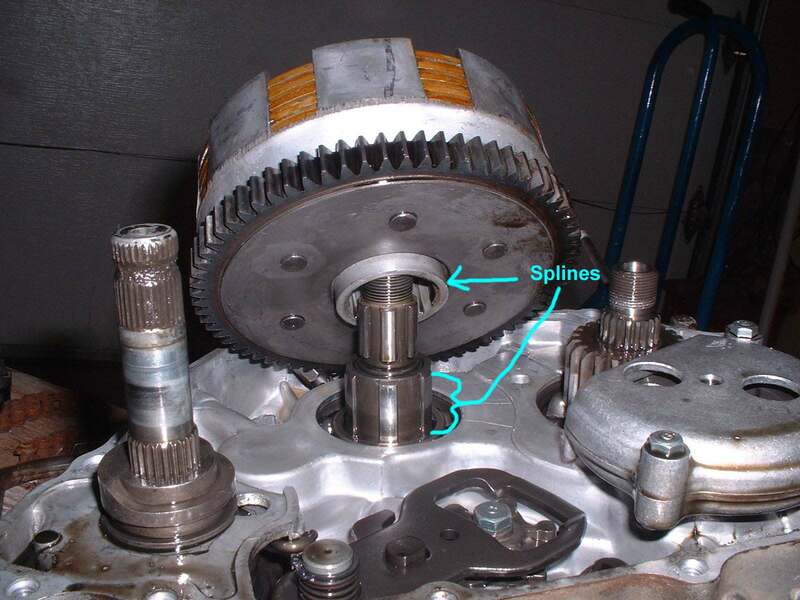 These pawls lock the shaft to the gear when the shaft is turned one way and release the shaft when it is turned in the opposite direction. Lastly is a Quadrant Gear Kick Starter. 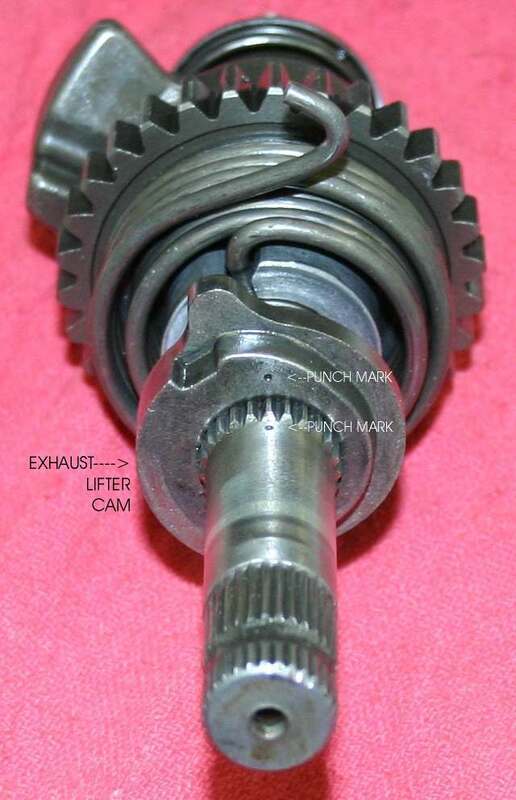 It uses a kind of half gear that engages a Kick Starter pinion gear when the Kick Starter is rotated. 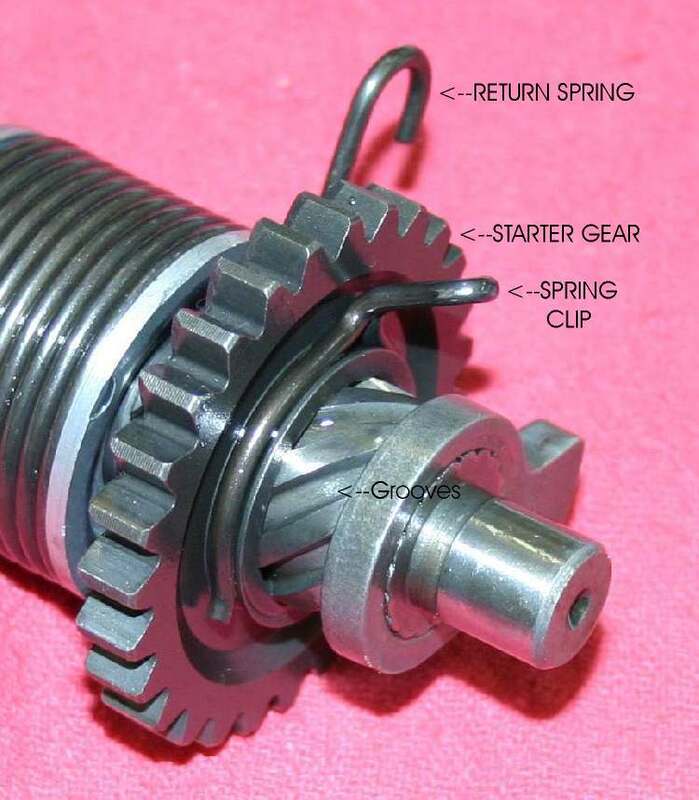 This spring loaded pinion gear has ratchet teeth that allow it to lock up when turned in one direction and slip when turned in the opposite direction. 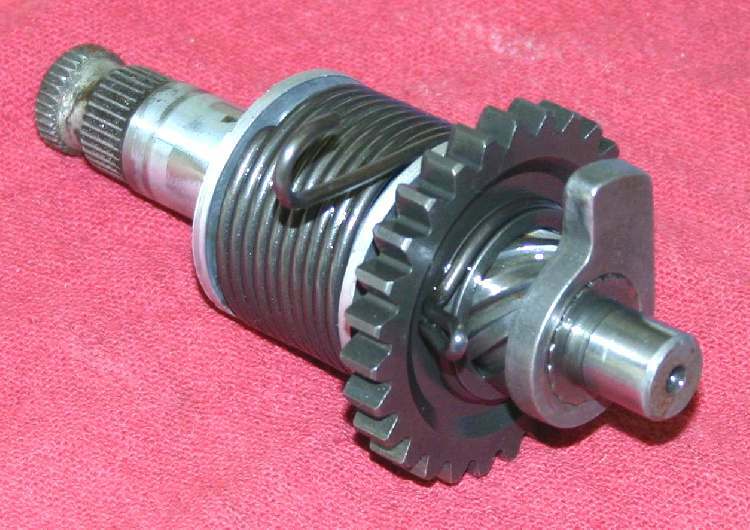 Quadrant Gear style Kick Starter are used by a number of British, European, and American Motorcycle engines. Most all Kick Starters use one of these four methods of engaging the Kick Starter gear. However, the details may vary a bit between manufacturers and even between different engines from the same manufacturer. Check your shop manual. 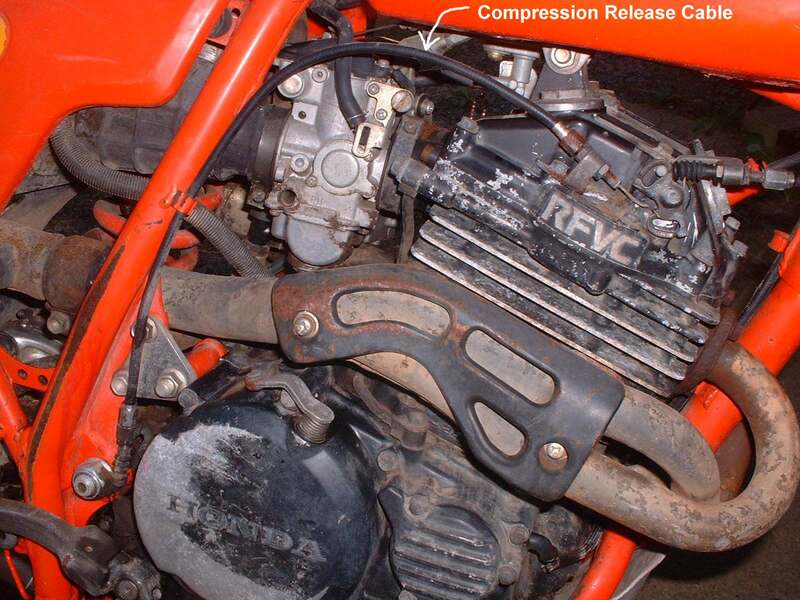 Some dirt bikes have an automatic compression release. 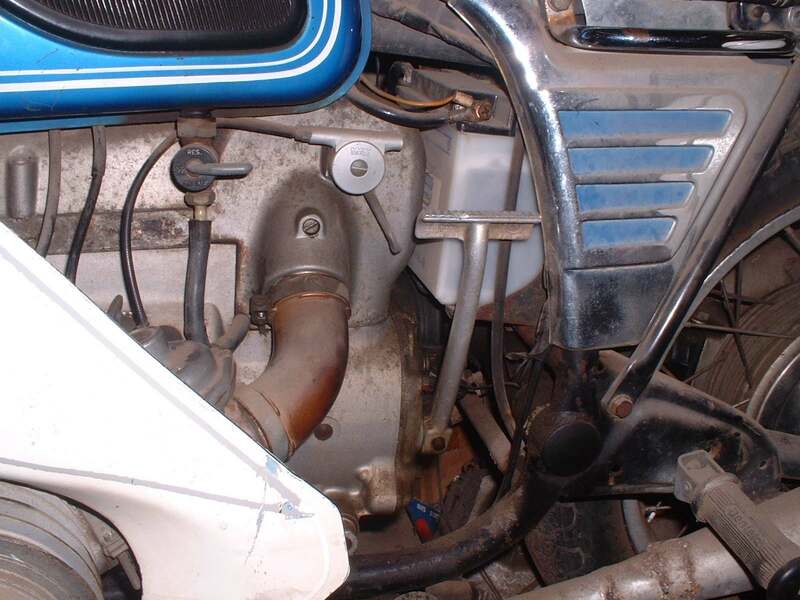 This is a little cam on the Kick Starter shaft that pulls on a cable, activating the compression release at just the right time, allowing you to start the engine with less effort. When you install the cam onto the Kick Starter shaft there will be tiny alignment punch marks on the Kick Starter shaft and the cam. These punch marks must align so the compression release works at the right time. Speaking of punch marks. 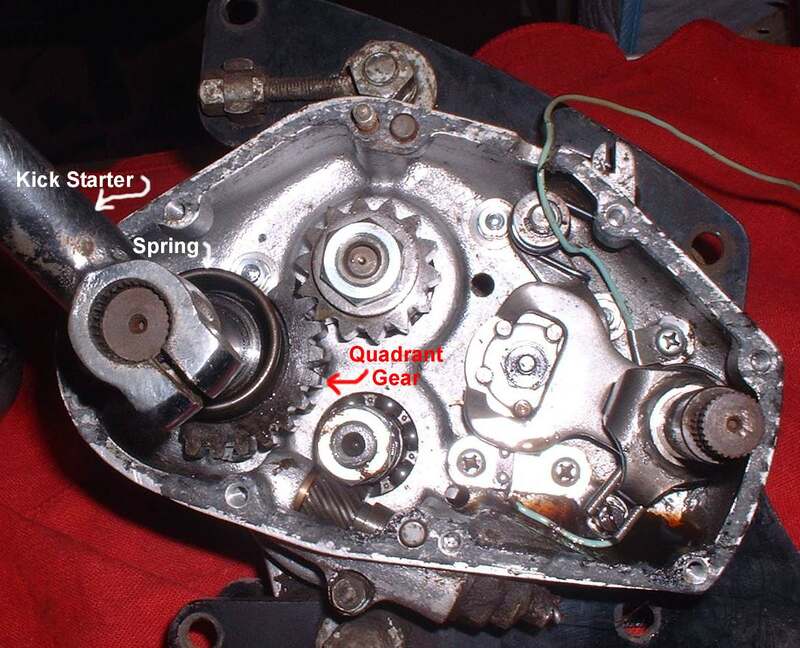 Some starter gears must be aligned to a certain position on the Kick Starter shaft. Punch marks are used here too. Always look for punch marks, on the shaft and gear, as you take the Kick Starter apart and match them up when you reassemble things. This gives you an idea as to how the Kick Starter works. The exact way is detailed in your shop manual but the general principles are all the same. The Kick Starter shaft must lock up when you kick it and unlock when you release it. I've seen some manufacturers of dirt bikes have five or six different variations of basically the same Kick Starter on their bikes. Why the changes, and they are all very minor changes, I cannot say. Got to be new and improved, right? 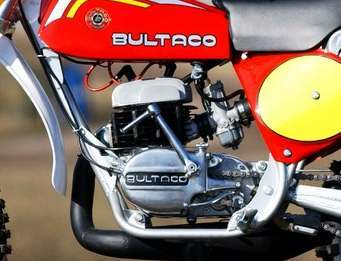 Some bikes like, Bultaco, have the Kick Starter on the left side. You start it with your left foot. The old Husqvarna dirt bikes did too. Even the Japanese did it. Remember the Suzuki Titan? A 500cc, two stroke twin. I don't particularly like Kick Starting with my left leg. You would think you would get used to it but I never could. It seems other people feel the same way as most bikes have the Kick Starter on the right side. 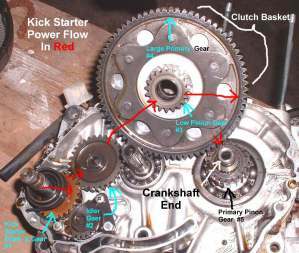 The power of the Kick Starter is channeled to the crank shaft of engine in one of two ways. At least I have only found two ways. 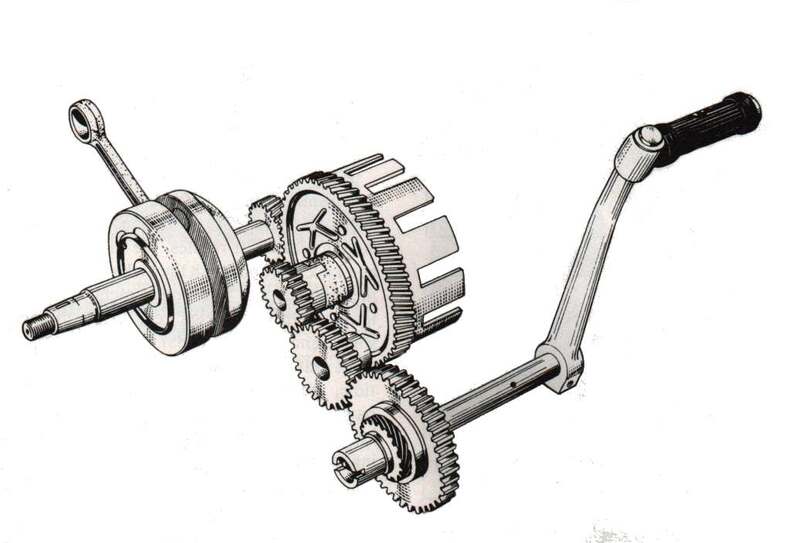 In the Primary Drive System the gear on the Kick Starter shaft (#1) moves and engages the Kick Start idler gear (#2) which turns a small Low Pinion gear (#3) on the Clutch Basket. The outside of the Clutch Basket has a larger Primary gear (#4) that engages the Primary Pinion gear (#5) on the Crankshaft. 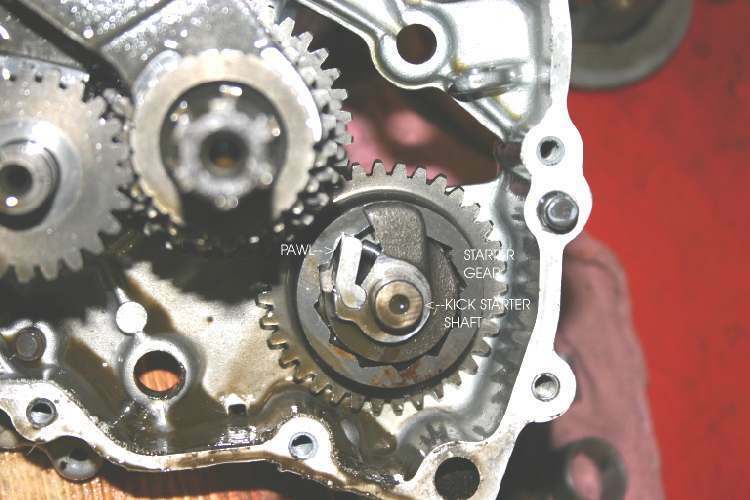 Because of this Low Pinion gear (#3) on the Clutch Basket, the power from the Kick Starter goes straight to the Crankshaft and NOT through any of the transmission shafts. 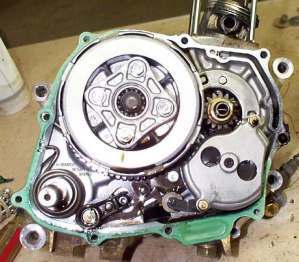 That enables the engine to be started even with the clutch disengaged. Starting while the engine is in gear is possible. That can be very handy if your engine dies on some steep dirt trail or the like. Your hanging there on the side of a mountain with a dead engine. It is somewhat difficult to shift down to neutral to restart your engine. In the Transmission Drive System, at least that is what I call it. While there is an "Official" name for the Primary Drive Kick Starting system there is no name for the other system that I know of. So I dub thee the "Transmission Drive System." 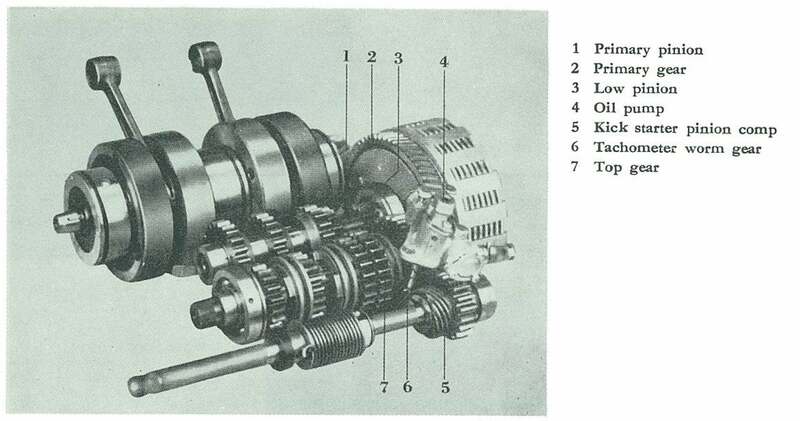 So in the Transmission Drive System the power from the Kick Starter shaft (#1) gear engages the main transmission shaft (#2). The Transmission main shaft passes power through the Clutch Center, through the Clutch Plates (#3) to the Clutch Basket Primary gear (#4) and on to the Crankshaft (#5). 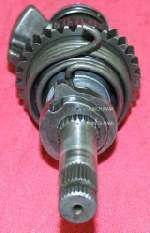 If the clutch is engaged the power will continue to flow to the Crankshaft, turning the engine over with the Primary Pinion gear. If the Clutch is pulled in and disengaged, the engine will not turn over. This makes starting in gear almost impossible. Well, yes, you could hold that front brake, give it a monumental kick, pull in the clutch just as it starts and not roll down that hill. Oh well, your right. it is much easier to roll, head over heels over motorcycle, on down that hill. Now you can have the Large, Clutch Basket, Primary Gear driven by a transmission gear through the clutch basket and not an Idler Gear. 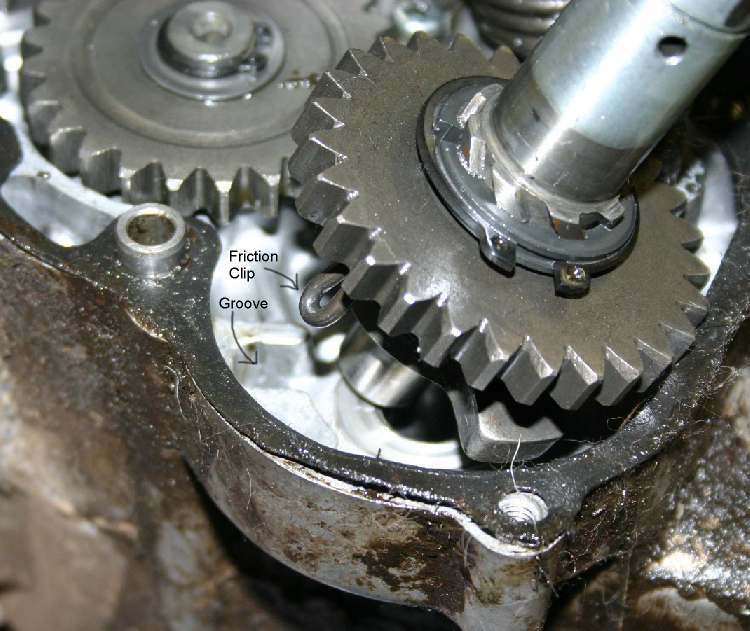 To work the Clutch Basket center must be a splined fit to a gear on the main shaft. 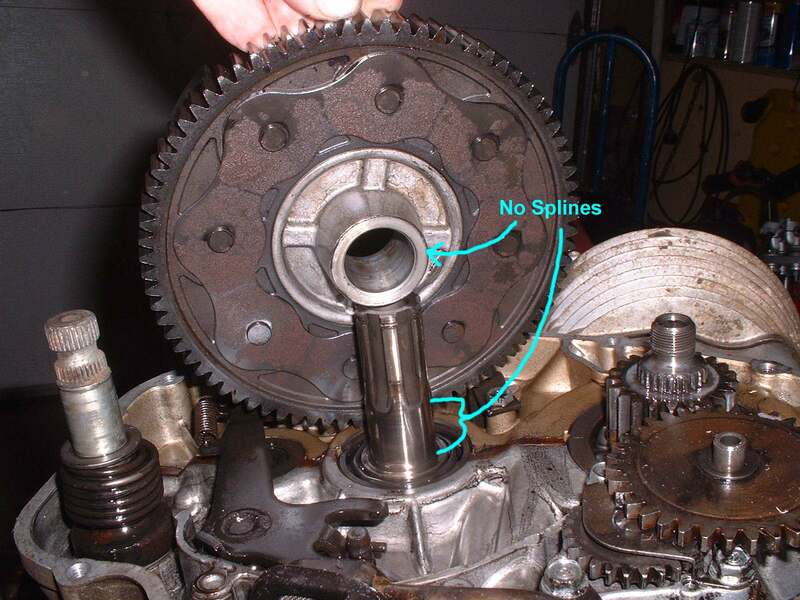 If there are no splines on the shaft and Clutch Basket and no idler gear or low primary pinion, then it no starty with the clutch pulled. How do you tell which system you have? Easy, while in gear, pull in the clutch lever and kick. If nothing happens you have the Transmission Drive type. If the engine turns over, you have a Primary Drive type. You got that? Lots of useless information here because whatever system you got, that is the system your stuck with. You can't change it. However, now you know how it works. 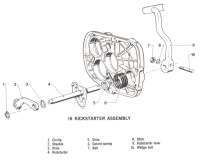 The Kick Starter must be able to spin the engine at least three or four hundred RPM. Most electronic ignition systems have an anti kick back feature that cut the ignition at low speeds. Just about all the newer street bikes have no Kick Starter at all. I guess they think we are all wimps and can't Kick Start our bikes in an emergency. Maybe they are right. All the movies I see now, have the big, bad, biker gang types, who run out, jump on their bikes and hit the button. It just isn't the same as when they Kick Started them! For lots of exploded Kick Starter views to study click Here. Copyright © 1999-2015 dansmc.com. All rights reserved.